Chiune Sugihara is a Japanese diplomat posted in Lithuania. He is also a world-class spy. In Lithuania he and his partner, Pesh, gather intelligence on European affairs. As WWII begins and Germany invades Poland, hordes of Jewish refugees flee to Lithuania. 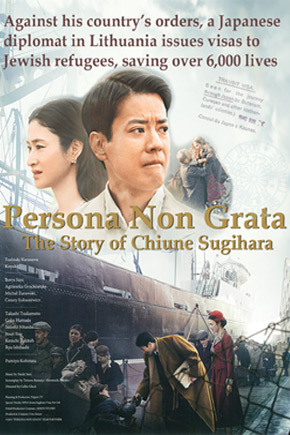 In search of transit visas, they turn to Sugihara who is torn between his loyalty to his country and his loyalty to mankind. Cellin Gluck (Director) Born and spending his ‘formative years’ in Japan and Iran, Cellin graduated from the Canadian Academy in Kobe before attending the Claremont Colleges, graduating from Pitzer College with honors from the Pomona College Theatre Department. Using his bicultural heritage to its fullest, he has spent the past 28+ years in film production with a particular emphasis on Japan. First advertising agency producer, to commercial director, then moving to films as an assistant director to Ridley Scott, Roger Spottiswoode, Mike Figgis, Sean Cunnigham and Robert Zemeckis among others. Cellin believes his multi-cultural upbringing and his own diverse ‘composition’ gives him an innate sensibility for things both Eastern and Western. Allowing him to bridge cultures visually, viscerally and artistically as well as emotionally.